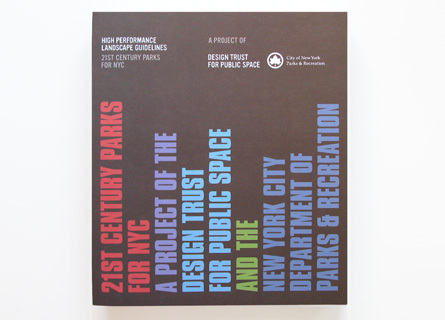 New York City High Performance Parks and Landscape Renewal is a comprehensive municipal guideline system for the design, construction and maintenance of sustainable parks and open space. Recognising the importance of green space as part of the urban environment this project aims to reduce any negative environmental impact of existing park systems, reduce reliance on motor transport, reduce urban heat island effect, improve drainage, provide habitat and increase the health and well being of the residents of NYC. 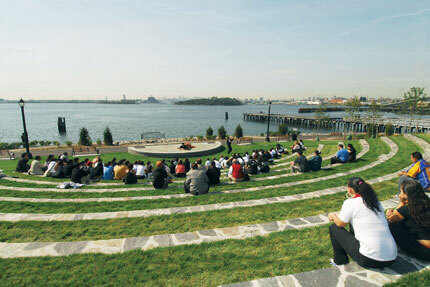 Nine major types of parks have been identified with guiding information relating to each; brownfields and recovered sites, restoration areas waterfronts, passive landscapes, active recreation areas, playgrounds, pocket parks and plazas, streetscapes and plantings over structures, such as green roofs. 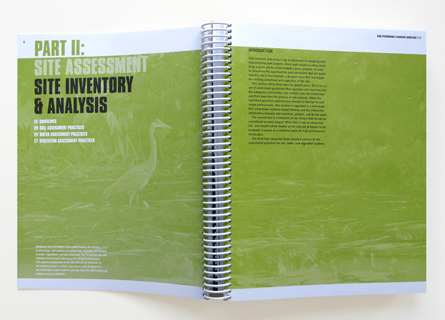 By culminating various fields of knowledge into one place the guidelines provide a step-by-step way of thinking about the design of new parks and open space. The project encourages the upgrade of existing parks, the addition of new parks and the reuse of brownfield sites and left over spaces to create highly performative and productive green space and promote sustainable transport (walking and cycling). The project aims to build a more active community through connecting green spaces and providing safe pedestrian and cycling routes, as well as address some of the climate change issues affecting the city, such as increased heat gain and stormwater run off from non-permeable surfaces. The NYC Parks department is in a unique and influential position, in that it is the sole agency for open space in New York City, enabling them act autonomously as landowner, designer and steward. The guidelines intention is to develop a unified approach to all open space by rethinking the way infrastructure is designed and to make sustainable choices convenient and therefore more likely to be taken up. The guidelines work in conjunction with New York City’s long-term plan and sustainability agenda, ‘PlaNYC ‘ and provides technical information on how to achieve the goals in the plan. PlanNYC outlines initiatives for improving transportation, housing, open space, brownfield redevelopment, water, energy, and air quality. 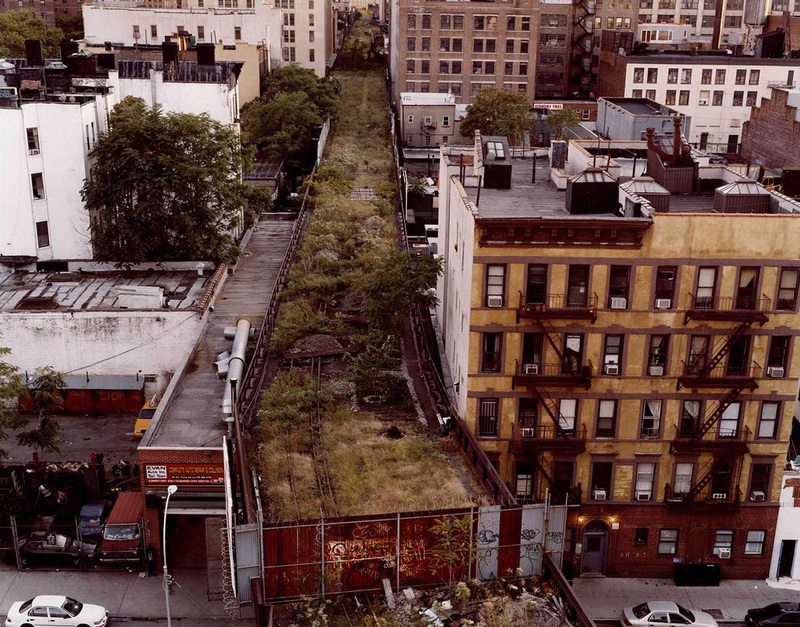 PlaNYC calls for the improvement of underdeveloped park sites and it articulates broad goals for the development of the city’s parks and landscape, such as ensuring that all New Yorkers live within a ten minute walk of a park, to clean up all contaminated land in New York City and to green the cityscape. A number of significant examples utilizing the spirit of guidelines have already been implemented, such The High Line, which reclaims a disused elevated railway to transform it into a 2.3 kilometre public park; The Bronx Watershed, a remediation project of the Bronx River and its associated 1500 acres of open space; and Freshkills Park, which is transforming the city’s largest landfill site into a new park more that three times larger than Central Park. The guidelines work across multiple scales from the revegetation of traffic islands and barriers, to changes in road infrastructures, through the reduction of car parking and the appropriation of these spaces into cycling and walking paths. The project aims to build relationships between natural systems and create green corridors throughout the city. By viewing all the parks as one integrated system rather that separate parks, the landscape scale of the implemented strategy will have positive across the whole city. More significantly, NYC Parks Department owns and manages 14% of land in New York City, providing it with an incredible opportunity to transform the city on a grand scale. Furthermore, by publishing and promoting the guidelines the NYC Parks Department strategy is likely to have a much further reaching impact throughout the United States and the international community. PlanNYC specifically looks to reclaim underutilised waterfronts, open and redevelop schoolyards as public playgrounds, increase options for competitive athletics, complete eight underdeveloped regional destination parks, provide more multi-purpose fields, install new energy efficient lighting, create or enhance a public plaza in every community, promote green roofs promote cycling, reforest targeted areas of parkland, and increase tree planting. In response to this the guidelines strategy is to not merely create undefined open green space, but to integrate activity based programs such as kayaking, horse riding, mountain biking, walking, ampitheatres and places to gather as a way of simultaenously improving the environment and quality of life. Additionally each park will employ a number of systems based technologies and engineering to work hard behind the scenes to capture water, produce energy (such as methane produced power from Freshkills Park), mitigate stormwater, produce food and improve habitat. The project assists designers, planners and architects to better understand natural systems of soil, water, and vegetation at a scientific level to optimise performance and ecological benefit and to reduce maintenance costs and labour of the infrastructure in the future. 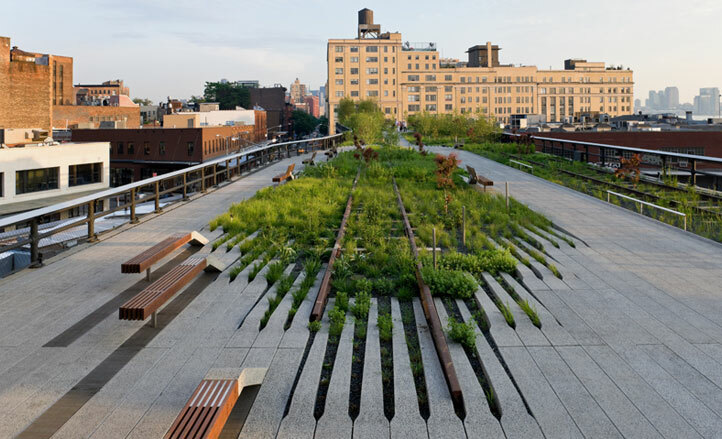 The guidelines are intended to work open space harder by engineering all the elements such as the soil, plants, water and infrastructure, to be highly performative. Like many sustainable initiatives the challenge is implementing and funding the unseen and less glamorous aspects of design; to not cut corners in the framework that underpins the long-term success of such ambitious goals. The opportunity for cities to be more connected to nature and productive through energy harvesting and urban agriculture has wide reaching benefits for the health and well being of both environment and the community.